I’m writing this as a self-professed Grammar Nazi. I defy you to find a book without an error in it. I defy you, no matter how much you understand English (and yes, although I am all for learning and speaking and using other languages, this is about English), to write 400 pages and make no mistakes. I defy you to read, re-read, edit, revise, have others look at it, re-read again, and still not find errors in your manuscript. For example, in my last book, WISHFUL THINKING, I was at the galley-proof stage (the point where they send you your book the way it will appear on the page, usually a pdf file), and I still found 147 errors. I know. I counted. But there are degrees of errors, and I put it to you that most are forgivable. A missing comma here or there shouldn’t cause you to write an angry letter. In fact, I know some publishing houses that omit commas on purpose. It’s the house “Style.” Just yesterday I read that one house forbids their authors from using semi-colons. Their reasoning? That genre fiction is supposed to pull the reader in; semi-colons stop the reader and interrupt the flow (See how I did that there?). I have to admit that rule made me cringe. You can’t ban semi-colons. That’s like the time I was kicked out of textbook training when I was teaching because I wouldn’t agree to disagree about what a verb is. But we are trying to make the writing accessible. Grammar and punctuation rules can fly out the window then. I know I make errors when I write. Sometimes because I think too fast for my fingers to type ( I never had typing in school. Somehow I skipped that required class). I skip words, or put in part of a word (like par for part) that is a word and my brain, knowing what to expect, fills in the blank. Have you seen those Internet memes that tout your amazing abilities to decipher words written with jumbled inner spelling or numbers replacing letters or backwards? It’s supposedly a sign of your intelligence. No, it isn’t. It’s your brain trying to make sense of what it sees and working the way it should. Sometimes I spell things wrong. I have never been a speller. Spelling is not grammar. I could go on about the seven different pronunciations of “ough”, the silent “b”, or why “ghoti” spells “fish”, but I’ve done that before. How the “t” in often was said, then silent, and now it’s back. Or not. Both are standard. What kind of language allows you to do that anyway? English, that’s what. I’ve always considered spelling a torture. When I write a novel I do look up every word I may have possible spelled wrong, but I may overlook some because I’m utterly convinced I have it right. And that’s not even worrying about “pore” vs “pour”, or “hear, hear” vs. “here, here” (By the way, those are the ones that throw me right out of a story–the homonyms used in place of the correct word). Sometimes things are left out by the printer. In my second novel, my galleys contained a chapter that wasn’t even from my book. Another time a chapter was repeated. I taught DANDELION WINE to my eighth graders. The books we used were missing a couple of paragraphs at the end of one of the chapters. That wasn’t done by the author. The errors I cannot forgive are content errors. When a character is a certain age, but that doesn’t work out mathematically (Don’t ask me why I catch math errors; I just do). When the character is a widow in one chapter and divorced a few chapters down. When the story is set in a certain year and then people or events are mentioned that couldn’t have taken place in that year (unless it’s alternate reality; then that’s fine). I’ve seen these mistakes in books I’ve read. And some of the mistakes are the readers’. I once used the word “posh” in a novel set in 1845. I knew the word wasn’t in existence then (yeah, I look that sort of thing up), but it was close enough to the time period that I fudged it. Someone had to use it first, right?) Well, a reader called me on it and gave me the “origin” of the word. It was that cute Internet story about the English traveling to India on a ship, Port Out, Starboard Home, so they’d know which side of the ship to have their cabins to avoid the sun. Only problem is that story’s not true. I had a friend correct me on “if you think X, then you have another think coming.” She wanted me to write “thing”. Nope, sorry, that’s wrong. (See what I did here with the commas–for effect) And just recently another friend pointed out I’d written “just deserts” wrong. Nope again. It is “just deserts”, not “just desserts”. And would you say, for example: “she is hungrier than me”? That would be incorrect. I just read an article about the physicist Paul Dirac. He had some quirks, but when he read WAR AND PEACE his only comment about he novel was that Tolstoy had made the sun rise twice in one day. (Mental Floss, Jan-Feb 2010). So you see, authors, editors, copy editors, translators (I read the German version of Harry Potter and they translated cat’s whiskers as a mustache), they’re all human. You may get a thrill at finding an error, but get over it. That’s kind of petty. (I know, because I have to admit I get a thrill and feel superior when I find errors. I’m not proud of myself.). Read the book and enjoy it. That’s why we write. I won’t even go into how ungrammatical speech is here. –Gabi, who really doesn’t proofread blog articles. Call it a life experience. My husband is a firm believer in life experiences. As am I, but he’s more apt to act on acquiring them. Then came the show. And here’s why humans are so interesting. Remember I said that I really don’t know “cowboy”. Well, I love country music. I also love Broadway show tunes, but that’s an entirely different blog. I started listening to country music when I realized it was singable. I sing. I used to have a good voice, but now I only sing for myself or in funny voices to make my kids laugh. I’ve appeared in several musicals, choirs, choruses, groups, but now I just like to sing to the radio in the car. (I don’t like people to hear me–yes, I’m shy–see “why humans are so interesting” above). And country music has harmonies, and lyrics and tunes one can actually sing to. Yes, some of it is bad, but I defy you not to say the same thing about any artistic endeavor. 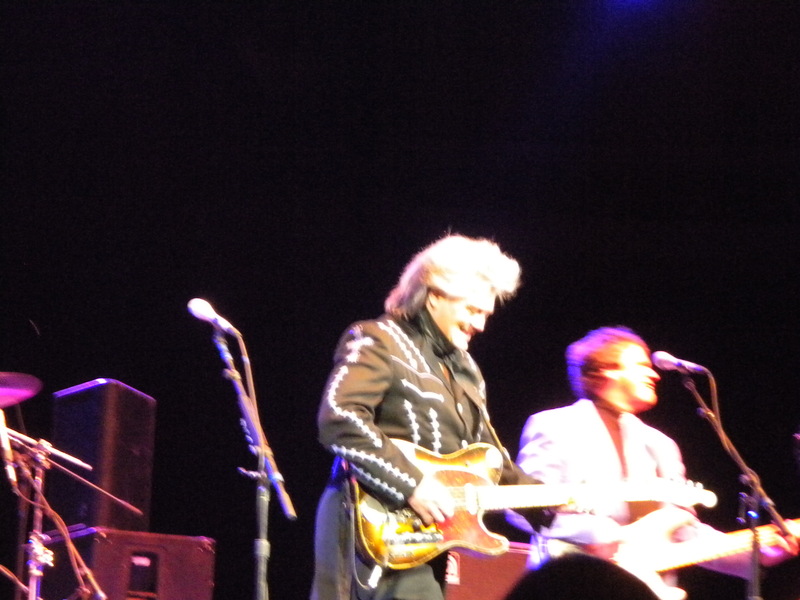 So, Marty Stuart. Part country, part rockabilly, part bluegrass, all awesome. What fun. 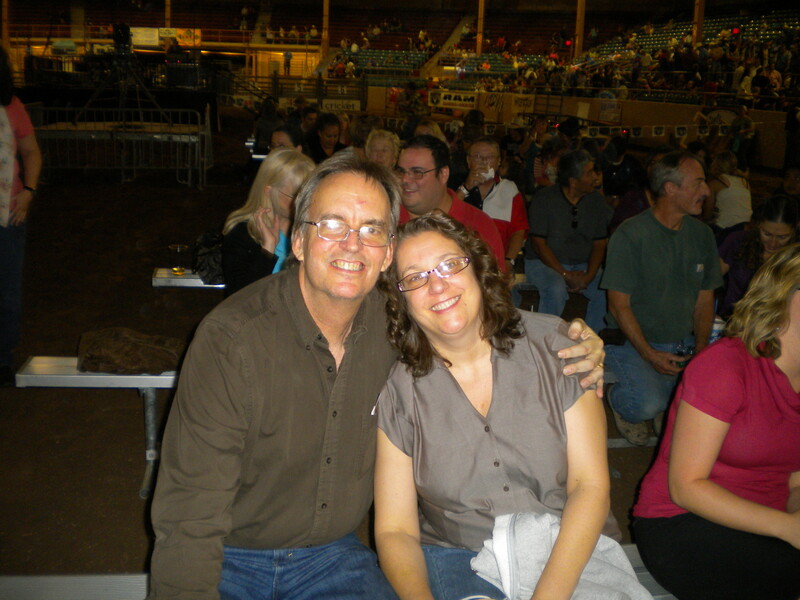 And the tickets hubs acquired for us allowed us to get up right next to the stage (on horrible steel benches placed right on the dirt of the rodeo ring). See? Here’s a photo from my seat. Great harmonies, mad skills on the guitar and mandolin, bopping music–it was good. But it was a Wednesday night and the youngest had school today and 6 AM comes early (see “you know I’m a whiner” above). Wish it had been Friday night. So my adventure at the State Fair didn’t change my opinion of the State Fair, but it did make me realize I should get out more. Just for fun I made a word cloud of all the words in all my published titles, past and present. As most of you know, my parents came from Hungary and neither spoke any English when they arrived (yeah, pronoun agreement–this is a casual essay; grow up). My father was an engineer who took a job as a janitor until he had rudimentary English. To the end of his life, his phone conversations in English consisted of saying “ja, ja,” (which by the way isn’t Hungarian) with the occasional “no” thrown in. My mother’s oral English was always much better. I grew up with Chicago pronounced CHi-cago, we lived in the “vest” and shopped at Wauns (Vons grocery, which makes no sense because Hungarian does have a v sound so why they switched the w and v sounds I’ll never know.) The past tense with “did” was always used incorrectly, as in, “I did went.” And my favorite: the day my father walked into a Burger King and ordered a whooper, not a whopper. The poor woman behind the counter tried so hard to keep a straight face. I laugh at the mistakes they made, not because I’m laughing at them. It’s out of love. Really. English has to be the hardest language to master. With seven different pronunciations of “-ough”, no common-sense spelling (really–Polish vs polish, wind, and a language where “ghoti” can be pronounced “fish”), where use of the subjunctive is considered too complex for regular language, where we have fake rules (never end a sentence in a preposition, conjunctions should never start sentences, never split an infinitive–these are all not real rules of English), where people will argue over “think” vs “thing”, as in “you’ve got another think coming” (it’s “think”–do the research), or that the phrase is “just deserts” not “just desserts” because the word comes from an archaic word desert (think “deserve”), and most native speakers have no idea what they’re saying when they use the old adage “it’s the exception that proves the rule” (that one necessitates the looking up of the definition of prove-what do you think a “proving ground” is?). So when my mother says nothing bad happened to her, “knock on the door”, instead of on wood, or thinks the famous fruit in Atlanta is the Georgia plum, I laugh, and admire the heck out of her. Because she’s willing to take a risk and communicate in a language that has many native speakers baffled. Here’s to the risk takers. Am I being closed-minded if I just don’t want to watch/read certain shows, films, or books just because? Take for instance the TV show Breaking Bad. There’s no reason not to believe its hype. It’s funny (at least I’ve been told the first couple of seasons are), well-written, has rounded characters, interesting story lines; it’s critically acclaimed and its actors have received acting awards. It’s even filmed in Albuquerque, my town, and the production company has brought money into the community. All good things. But I don’t want to watch it. Stories about drugs are not my kind of thing. Stories about men who descend into darkness–not my kind of thing. So I haven’t seen it, and despite having it on Netflix, I won’t be watching it any time soon. I’m sure it deserves its accolades, but I don’t want to watch it. There are books that do the same. Every time I pick up a book I should read (Kite Runner, Life of Pi) I’ve been disappointed. It’s not that I don’t see the merit of the books, but when I read I want to be swept away. I don’t want to search for its merits. I could see teaching these books, but not sitting down to read them for fun. My taste. I won’t apologize for it. And don’t think I’m not as harsh on my beloved genre fiction books. I’d say more than half of them I read the first two, maybe three chapters, then just skim the rest to know what happens (unless I’m judging it for a contest; then I read every page). The book that carries me through page by page is a rarity. And one that is becoming more and more rare. So many things can pull me out of the story: a wrong fact, grammar errors (I mean the ones that aren’t deliberate), and most of all lack of logic. I just finished judging a contest and the biggest errors I found in these unpublished manuscripts was lack of logic. People I know wouldn’t behave a certain way without a good reason, and needed a behavior to further the story is not reason enough. We all have our limits, buttons, narrow view. I’m trying to broaden mine when it comes to important things. But do I have to when it comes to entertainment? Am I being closed-minded?